Tell us about the outline of the course. What can I expect from the classes? What do I need to prepare? The course is designed around creating a deep, experiential understanding of our spiritual, mental, physical and energetic bodies, so that a mastery of mind and self can be established. The idea of this course is to overcome unhealthy habits by creating healthy, sustainable habits to reorganise the way we view the world, and how we show up for ourselves in different situations in our everyday lives. Through the duration of the course, students are encouraged to practice a Healing Addictions meditation to stimulate gland health and activity daily. Each week, classes will focus on different areas of yogic anatomy and philosophy via talks, pranayama, kriya (set of postures), mantra and meditation. Students will have an opportunity to take home work in the form of questions for self-reflection, journaling, self-inquiry practices, yogic cleansing diets and notes from each class. To prepare for the course, students are required to fill out a student intake form. The course is suitable for anyone with a willingness to overcome negative patterns to experience a fulfilling, liberated state of being. It is a course for healing addictive patterns not for detoxing so is not suitable for those with a substance dependency. Addiction is quite a strong term; how do I know if it’s right for me? What are addictive patterns? Unfortunately society has stigmatised the term addiction. An addiction is simply a pattern or habit. All of what we do, say or think are patterns and habits. The only difference is whether or not the habits are healthy or unhealthy. This course is right for you if you are wanting to bring your awareness to when the habits/patterns are playing themselves out and how to consciously shift them in the moment. Is it going to be physically demanding? Can I do it when I have an injury? There will be some physically demanding aspects within class though modifications will be offered if needed. The main focus of the course is a Healing Addictions meditation which anyone (even with an injury) can do. This course will work on healing mental, emotional, and energetic blocks which can be of great benefit to healing physical injury. 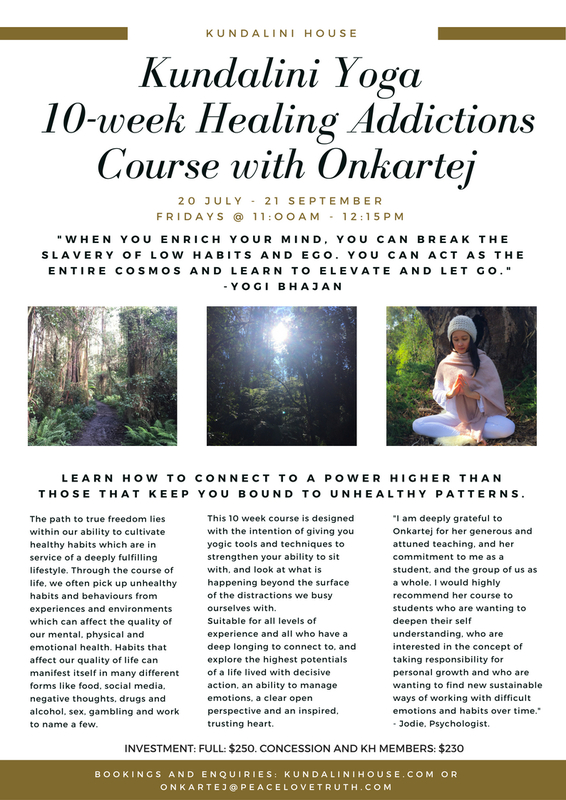 Onkartej offers the 10-week Healing Addictions Course at Kundalini House. She teaches regular classes on Thursdays and Sundays. Call reception, book online or through our app. We have a new full time job opportunity!